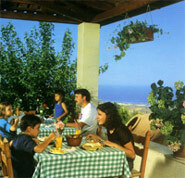 Capital of the West and positively teeming with history is Pafos, site of the island's second international airport. The resort town has as its focal point a charming fishing harbour by Pafos Fort, lined with open-air cafes and tavernas that serve a tempting menu of the day's catch. It was on Pafos shoreline that the mythological Goddess Aphrodite was born a legend that spawned a massive wave of cult worship from neighbouring countries that lasted several centuries. 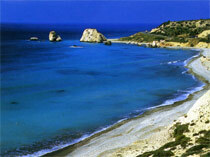 The large rock that juts from th sea is known as "Petra tou Romiou"- The venus Rock- while the Baths of Aphrodite at Polis also echoes her apparent penchant for the island. At Palepafos, Kouklia lie the remains of the Goddess earliest Sanctuary. Another "first" for Pafos was its early recognition of Christianity. While under Roman rule in 45 A.D., it was here that Saint Paul converted the first ruler to the faith. The legacy from its remarkable history adds up to nothing less than an open museum, so much so that UNESCO simply added the whole town to its World Cultural Heritage List. Among the treasures unearthed, are the remarkable mosaics in the House of Dionysos, Theseus ans Aion, beautifully preserved after 16 centuries under the soil. Then there are the musterious vaults and caves, The Tombs of the Kings, the Pillar to which Saint Paul was allegedly tied and whipped, the ancient Odeon Theatre and other places of interest including the Byzantine Museum and the District Archaelogical Museum. Geroskipou with its remarkable five-domed Byzantine church of Agia Paraskevi, and its Folk Art Museum is a village known for many years for its special delight "loukoumi". Agios Neofytos Monastery, famous for its 'Encleistra', Enclosure, carved out of the mountain by the hermit himself, boasts some of the finest Byzantine frescoes of the 12th and the 15th centuries. Chrysorrogiatissa Monastery makes its own range of wines using homegrown grapes. A small museum dedicated to Archibishop Makarios, is found at Pano Panagia. From here it is a rewarding drive to the majestic Cedar Valley. home of the indigenous Cyprus horned sheep, the moufflon. Lempa village can be singled out as one with particylar historic significance. In its pretty setting near the sea, Lempa's link with prehistory is the site of a chalcolithic settlement. today the faithful reconstruction of several dwellings, gives an insight into chalcolithic life on the island. Further north lies the resort-town of polis, overlooking the beautiful Chrysochou Bay with its charming fishing refuge of Latsi. The relatively unspoilt state of the countryside and villages make the area a real delight for the walker and naturalist.